China still has more room and tools in its monetary policy to tackle downward pressure in the economy, and its fiscal policy will be more proactive, central bank governor Zhou Xiaochuan said on Friday. Zhou, speaking at a conference held by the Institute of International Finance in Shanghai in conjunction with a G20 meeting of central bank governors and finance ministers, also said that the direction of China’s reforms will not change, but that the pace might change. “Given the current situation of the Chinese and global economy, our monetary policy is now prudent and relatively accommodative,” Zhou said, according to Bloomberg. He added that there was no basis for persistent depreciation of China’s yuan. Betting on a further depreciation in the value of the yuan is one of the most popular trades being put on by some of the biggest hedge fund managers in the business. This trade got particular notice earlier this month when Hayman Capital’s Kyle Bass outlined his view that the yuan would need to fall in value given a dearth of reserves in its banking system. Texas Sen. Ted Cruz attacked Donald Trump over his reality-television career at the Republican presidential debate on Thursday. Trump and Cruz have been attacking each other relentlessly for weeks as they fight for their party’s presidential nomination. Cruz also accused Trump of funding the “Gang of 8” bill, which refers to the eight senators who championed a comprehensive immigration-reform bill in 2013. Cruz said Trump gave over $50,000 to three Democrats and two Republicans in the group. “When you’re funding open-border politicians, you shouldn’t be surprised when they fight for open borders,” Cruz said. I can only say this, and I’ve said it loud and clear and I’ve said it for years: … I’ve had an amazing relationship with politicians both Democrat, Republican, because I was a businessman. … I got along with everybody. You get along with nobody. You don’t have one Republican senator … backing you. Not one. You don’t have the endorsement of one Republican senator and you work with these people. You should be ashamed of yourself. 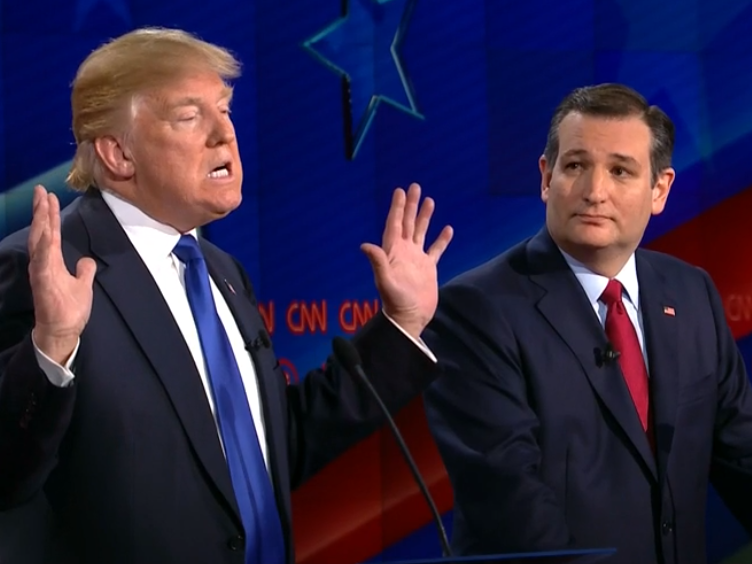 Cruz then pivoted to Trump’s alleged history of hiring illegal immigrants. Critics have long accused Trump of exploiting Polish immigrants who entered the US illegally to help build Trump Tower some years ago. “Anyone who really cared about illegal immigration wouldn’t be hiring illegal immigrants,” Cruz said. Sen. Marco Rubio went after Donald Trump head on during Thursday night’s Republican presidential debate. Near the debate’s opening, the senator immediately criticized Trump for supposedly hiring non-American workers at his hotels. Several minutes later, the pair went at it again. 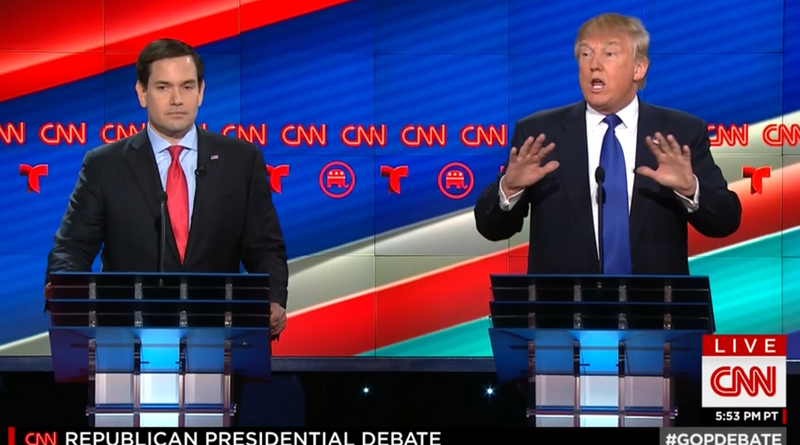 Rubio returned to his critique, urging viewers to Google Trump’s hotel-worker fines. 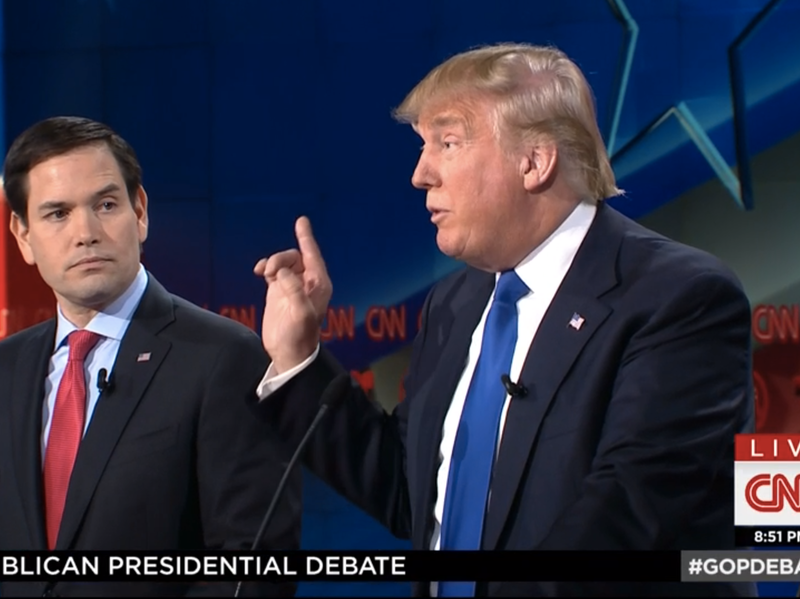 “If he builds the wall the way he built Trump tower, he’ll be using illegal immigrant labor to do it,” Rubio said. Republican presidential frontrunner Donald Trump started ripping Mitt Romney the moment the 2012 GOP nominee’s name was mentioned at Thursday night’s primary debate. Rubio was suggesting that it was a shift for Trump to take such a fierce tone on illegal immigration today. “I criticized Mitt Romney for losing that election. He should have won that election,” Trump shot back. Rubio noted that it was “on the record” that Trump appeared to criticize Romney from the left on the “self-deportation” issue during the 2012 race. At the time, Trump was quoted calling the term “mean-spirited” and that said it cost Romney votes from Hispanics. Trump has made his hard-line stance against illegal immigration the centerpiece of his 2016 bid. He and Romney have been increasingly sparring in recent days. Trump has suggested that Romney was waiting to endorse Rubio. English fund manager Chris Ruffle’s improbable ten-year journey to make a decent bottle of wine in China.